This is one of my favorite flower clips. It is just the right size and simply sweet. 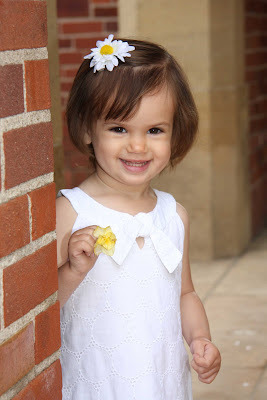 In fact, I used it for my daughter's 2 year photos. A white daisy with a bright yellow natural center is attached to an alligator clip partially lined with ribboon. As usual, I've added a non slip grip added to unsure it will stay in the finest of hair.